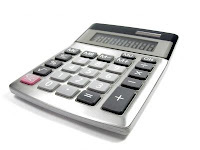 The MTS HPLC calculator now includes calculation of void volume. This calculation may be useful when multiples of column volumes are required, e.g. for equilibration, and also in HPLC method development to estimate t0, the time in the chromatogram when unretained compounds, e.g. the solvent front, will elute. The 5 step strategy for HPLC method development which is taught in MTS training courses is now available in a summarised format as a free download. 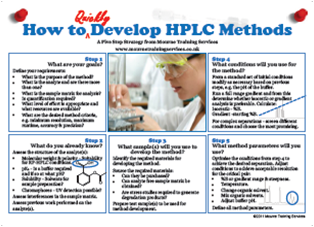 Click on the picture to download this useful guide to the important steps in HPLC method development. It is designed as an A5 postcard but will also print well on an A4 sheet.